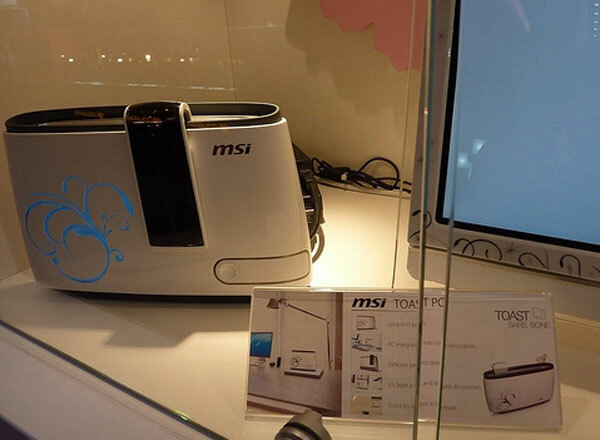 MSI has launched a new nettop PC, called the MSI Toast PC, although it wont actually make you toast it is designed to look like a toaster, why? we have no idea maybe they want people to use it in their kitchen. The MSI Toast PC feature a slim toaster like design, and it has a slot loading DVD drive on the top that loads your toast, er I mean DVD and it also comes with a remote that can be attached onto the side. The design is a little, shall we say strange, and I am not sure of it will catch on, who knows maybe the next nettop we see from MSI will be called the Blender PC.